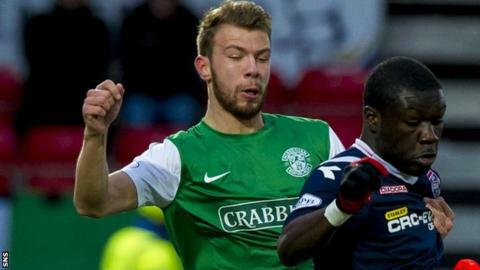 Hibernian defender Jordon Forster has signed a new contract that keeps him at Easter Road until the summer of 2016. The 19-year-old, who played in last season's Scottish Cup final, has started in the Edinburgh side's last four matches. And Forster has helped new manager Terry Butcher get off to an unbeaten start, with two clean sheets. "I'm enjoying every minute of my time at Hibs and believe I'm improving as a player," he told the club website. "It's great to have the security of a long-term contract and now I can just concentrate on doing well for Hibs and helping us progress on the pitch. "The new manager has been great with me and given me an opportunity to show what I can do." Forster, who made his Hibs debut in an Edinburgh derby win at Tynecastle last season, had previously been out on loan at Berwick Rangers and East Fife.